It started with a joke. When Stone Brewing Company released a black IPA in 2007, an employee quipped, “What’s next, a golden stout?” And thus the gears started turning Stone Brewmaster Mitch Steele’s head. Seven years later, the joke’s on us all (in a good way). 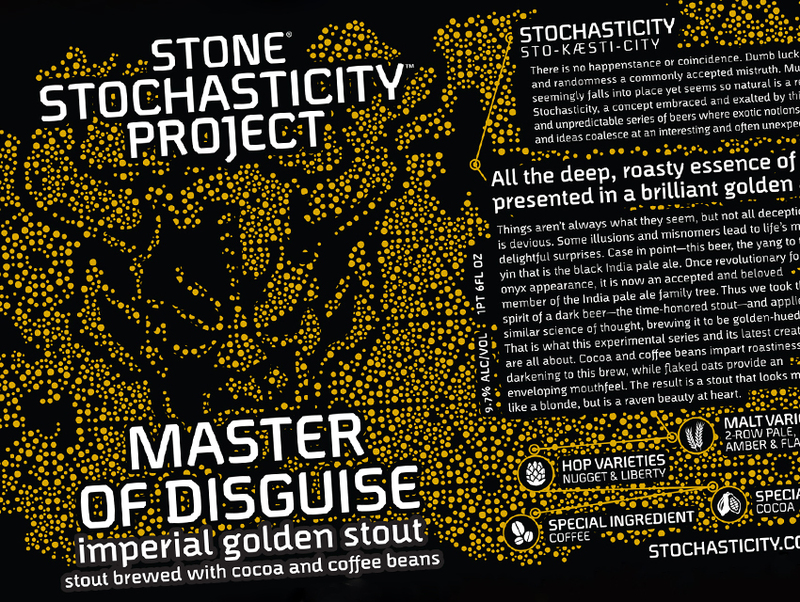 Stone unleashed Master of Disguise this week, an imperial golden stout released under the Stone Stochasticity Project line of beers. Steele says the beer keeps the creamy mouthfeel of traditional stouts by using flaked oats. And the signature stout flavors come from sheets of cocoa and coffee. So far, so traditional. But Steele dropped roasted barley and black malts from the brewing process to achieve the color. For stout enthusiasts, encountering a stout with the golden hue of a lager is a bit like coming upon a shark with wings: disconcerting and deeply awesome. That’s the point, Mitch Steele says. “People are a little confused by it, but we’re having fun. We like to take risks.” And Stone’s not the only Southern California brewery to give the golden stout a go. In fact, golden stouts were born in SoCal. Noble Ale Works’ Naughty Sauce came out in 2012, and has pretty much been the first and last word in golden stouts since. Unlike Master of Disguise, which is available on tap and in bottle form, Naughty Sauce is served only on nitro. And that’s where a lot of the delicious creaminess comes from, says Price. The rest comes from oats and coffee, much like Stone’s golden stout. It takes three to make a trend, right? Well then I’d like to formally thank Angel City Brewery for rounding out our list today. Their White Night golden stout is a pretty solid offering from the Downtown brewery, and is also available only on nitro. As for the next implausible category of beer, maybe a citrus porter? A sessionable barley wine? A coffee sour? I think I’ll leave the tinkering up to the experts. And have a golden stout to keep me busy in the mean time.